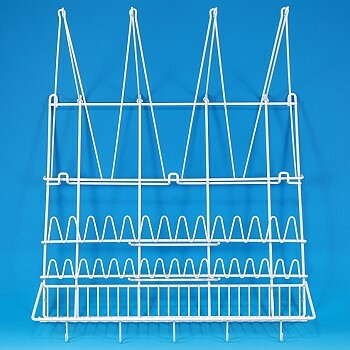 Bakery Wall Rack has a tiered design to easily organize, display and air dry pastry bags, tips and smallwares. Commercial grade all metal construction finished in a durable white coating. Top frame supports 4 pastry bags. Second frame holds 14 large pastry tips. 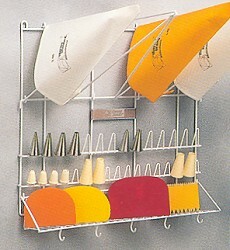 Bottom shelf is ideal for holding small tools and spatulas, with 5 additional hanging hooks. Length 20 1/2"", width 19 1/2", height 13 1/3"